The Colts–Patriots rivalry is a National Football League (NFL) rivalry between the Indianapolis Colts and the New England Patriots. It is considered one of the most famous rivalries in the NFL. The two teams have combined for seven Super Bowl victories (six by the Patriots) and ten AFC Championships (eight by the Patriots) since 2001, while both are noted for their organizational excellence. The Colts and Patriots met in their first AFC Championship game since 2004, a game in which New England won en route to their third Super Bowl Championship in 4 years. The Patriots and Colts were both wild card teams at the end of the 2006 season, the first time in the series history that they had met in the playoffs as wild cards. New England was coming off of wins over the Jets and Chargers, and finished the 2006 season with a 12-4 record. The Colts were also 12-4, but finished ahead of the Patriots by virtue of their head-to-head win over them during the regular season in Foxborough. The Colts were coming off wins over the Chiefs and Ravens. In this game, the Patriots ran out to a 21-3 lead in the 2nd quarter, but the Colts would pull off a fierce comeback to win 38-34, the largest comeback win in conference championship history at the time. With 1 minute remaining in the game, Joseph Addai rushed in for a touchdown from 3 yards out to give the Colts the lead. The game was sealed with an interception by Marlin Jackson with 14 seconds remaining, sending the Colts to the Super Bowl, which they won 29-17 over the Chicago Bears. The 15-point comeback by Indianapolis was the largest in conference championship history until it was broken 9 years later in the 2014 NFC Championship game, in which the Seahawks came back from 16 points down to beat the Packers 28-22 in overtime. The 8-0 Patriots faced the 7-0 Colts in the RCA Dome, the latest in a season that two undefeated teams had ever faced off. The Patriots had scored over 34 points in every game but the Colts defense stifled the Patriots' attack and Indianapolis clawed to a 20-10 lead in the fourth. But a 58-yard Tom Brady bomb to Randy Moss was caught at the Colts' 3-yard line, leading to a Wes Welker touchdown catch. After stopping Manning and forcing a punt, a strong kick return by Welker set up a three-play touchdown drive highlighted by a 32-yard catch by Donté Stallworth and a Kevin Faulk touchdown catch. Manning was hit and threw the ball into the hands of Rosevelt Colvin on the next Colts drive and the Patriots ran out the remaining clock for the 24-20 win. This win was number 9 in the Patriots' 16-0 regular season. Before leading the Patriots to seven Super Bowl appearances and five Super Bowl wins as head coach, Bill Belichick's first job in the National Football League was as an assistant with the Baltimore Colts in 1975 under head coach Ted Marchibroda. In 1996, Belichick, then the head coach of the Cleveland Browns, returned to Baltimore following the Browns relocation but was fired shortly after the move. He was replaced by Marchibroda, who had just completed a four-season stint with the Indianapolis Colts. Belichick then took his first job with the Patriots, becoming an assistant under head coach Bill Parcells for the 1996 season. Kicker Adam Vinatieri made the iconic winning field goal against the St. Louis Rams in Super Bowl XXXVI with the Patriots and also played with them in three other Super Bowls (XXXI, XXXVIII, and XXXIX), winning three in total out of four. After the 2005 season, the Patriots chose not to place the franchise tag on Vinatieri as they had the year before, allowing him to become a free agent. He joined the Colts in 2006 and won the subsequent Super Bowl with them to earn his fourth ring. He was injured during the 2009 season, and did not play in Super Bowl XLIV, which the Colts lost 31-17 to the New Orleans Saints. In 2009, the Colts finished the regular season 14-2 with the best record in the NFL, and an AP MVP award for starting quarterback Peyton Manning, while the Patriots finished the season 10-6 receiving the No. 3 seed. The exact reverse would occur the following season, with the Patriots' starting quarterback Tom Brady winning AP MVP honors. None of the teams though, would win a Super Bowl. 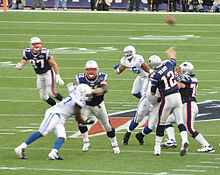 The 2009 Colts were defeated by the New Orleans Saints in Super Bowl XLIV while the 2010 Patriots were knocked out in the Divisional Playoffs by Mark Sanchez and divisional rival New York Jets, who had narrowly defeated the Colts 17-16 in the Wild Card round a week earlier on a last-second field goal. Quarterback Jacoby Brissett was drafted by the Patriots in 2016 and played in three games in that season with wins over the Dolphins coming off the bench and against the Texans as starter. After a five-touchdown performance against the NY Giants in the 2017 preseason with the Patriots he was traded to the Colts for receiver Phillip Dorsett after a season-ending ACL tear to Patriots' star receiver Julian Edelman. Josh McDaniels agreed to become Colts head coach for 2018 and even began hiring a staff such as assistant coach Joe Judge, but on February 7, a day the Colts officially announced him as head coach, he abruptly backed out of the deal to stay with the Patriots. The two teams met in 2018 for the first time in three seasons and McDaniels' Patriots won 38-24. The rivalry forms the basis of a Sprint telecommunications television ad for their service providing NFL updates to cell phones. In the ad, a cell phone opens up to form a miniature NFL stadium with the Patriots logo in one end zone and the Colts logo in the other (the only scenarios in which this type of field layout would occur are the Pro Football Hall of Fame exhibition game and the NFL International Series). As two men watch, a winning field goal is kicked and fireworks erupt. The winner is not named but evidence suggests the Patriots, as the "game" call is by New England's radio play-by-play announcer Gil Santos. ^ "Indianapolis Colts vs. New England Patriots Results". The Football Database. Retrieved 2009-11-15. ^ a b c Chadiha, Jeffri (2007-10-31). "Ranking the NFL's best rivalries: Where does Colts-Pats fit?". ESPN.com. Retrieved 2009-01-24. ^ Reiss, Mike (January 31, 2007). "Polian takes stand". The Boston Globe. ^ "No matter which way you dissect it, Bill Belichick made the wrong call". CNN. November 16, 2009. ^ Snyder, Whitney (November 16, 2009). "Bill Belichick's 4th-And-2 Call Against Colts Debated, Derided (VIDEO)". Huffington Post. ^ Bell, Jarrett (November 17, 2009). "NFL Replay: Failed fourth down call a stain in Belichick's record". USA Today. ^ "Source: Tuesday meeting convinced McDaniels". ESPN.com. Retrieved 2018-02-08.